Just a few weeks ago I received an e-mail from a dear friends daughter, Natalie. Natalie asked if she could submit a blog post that she and two friends, Lydia and Savannah, had been whipping up in the kitchen. How could I refuse my first request for a recipe submission? And, oh, what a recipe it is. It is a dessert that they are calling “baby babas”. So, in their own words and with their own pictures, I’m super proud to share this scrumptious looking dessert with you. I’m off to bake it myself! Many thanks Natalie, Lydia and Savanna! Here is how to make a Polish dessert known as babeczki smietankowe (ba­BECH­kee shmye­tan­KO­veh)! We prefer to call them baby babas. Next, gather supplies: cooking spray, muffin tin, stand ­mixer bowl, plastic wrap, measuring cups, measuring spoons, wooden spoon, whisk, rolling pin and timer. Attach bowl and paddle attachment to stand­mixer. Make sure the bowl is fully clicked in. Cut in butter and flour until coarse crumbs form. Add sugar, egg yolks, and vanilla until thoroughly mixed. To separate the yolks, crack the egg, but leave the yolk in half of the shell. Transfer the yolk to the other half, emptying out the whites as you go. Knead dough on cutting board, squashing any air pockets. 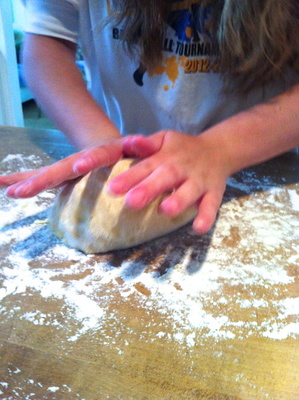 This dough is very sticky, so use lots of flour! Wrap dough in plastic wrap, and place in fridge for 10 minutes or so. This prevents the dough from being too sticky when you cut it later. Beat eggs, egg yolks, and sugar for 5 minutes. Add vanilla and cornstarch. Beat more. Continue beating while adding the hot half­and­half. To heat up the half­and­half, pour into glass measuring cup designed for liquids. Pour mixture in a non-reactive bowl and place in microwave for 2 1/2 to 3 minutes on medium high heat. Take out of microwave and pour into a medium size sauce pan (with high sides). Cook mixture on low heat, stirring constantly until thick. Be sure you whisk at a high speed. Cool custard in refrigerator until completely cool. Preheat oven to 400 degrees. 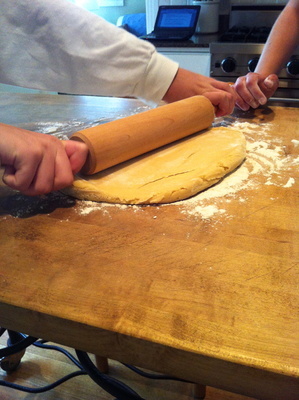 Roll out dough to 1/4 inch thickness. Grease muffin tin. Cut circles large enough to line standard muffin tin. We just used a plastic cup to do that. 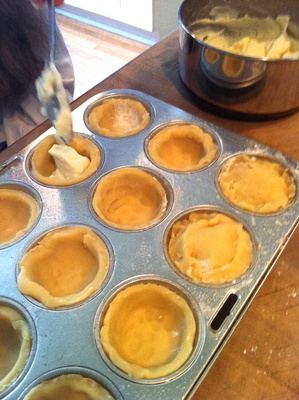 Once circle is placed into tin, fill 1/3 full with custard. 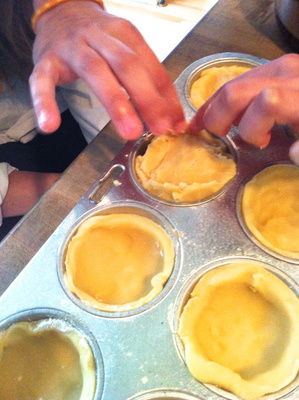 Cover each filled circle with another another smaller circle of dough and crimp edges. To crimp, pinch top and bottom edges together. Bake for 15 to ­20 minutes, or until golden brown. Let the baby babas sit and cool completely before removing them from the tin. Otherwise, the babas will fall apart. We recommend serving the baby babas after they have been in the fridge for a few hours. The custard tastes much better when cold.